Simply Chickie Clothing makes 100% organic cotton clothes for little ones. Designed by Gwendolyn Gardner, a direct descendant of The Scarlet Letter author Nathaniel Hawthorne, the baby clothes are whimsical, humorous, pesticide free, and made in the USA! Certified organic cotton is cotton grown in fields where the use of pesticides has been discontinued for at least 3 years and where rigorous controls help rebuild the soil’s natural fertility. Organic farming is a farming system that relies on natural inputs only. No synthetically produced pesticides or fertilizers are used. Beneficial insects are allowed to flourish to keep pest insects in check. Crop rotations with legumes help maintain fertility and soil microbiology. Weeds are controlled with precision tillage and the old fashioned hoe. The successful organic farm requires much more intensive and innovative management. Gwendolyn is also a mother, and her daughter provided an impetus to start Simply Chickie, as well as a muse for her designs. 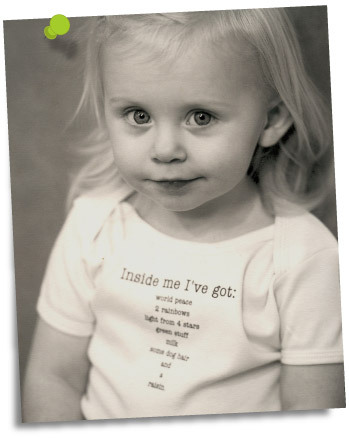 “My designs are based on some antic by Elizabeth or by one of her little friends.” Simply Chickie onesies, hats, and t-shirts are super cute and sure to draw comments from family and friends. Love the designs! I also love the fact that they have called out that the cotton is grown in fields that have been pesticide free for 3 years. Thanks for letting us know about this brand!